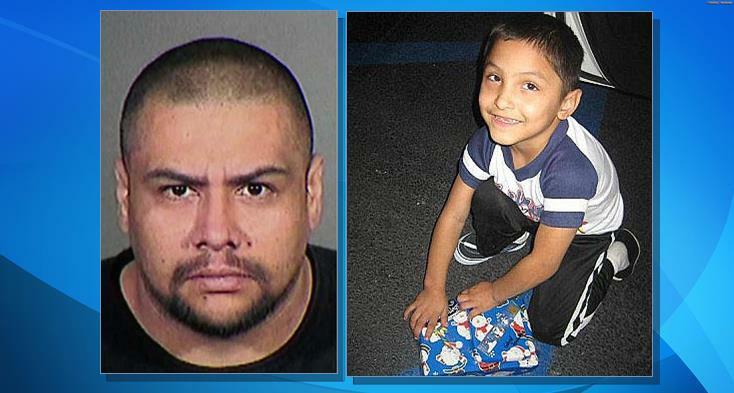 LOS ANGELES – One of the younger sisters of a Palmdale man convicted of the torture-murder of his girlfriend’s 8-year-old son testified Tuesday that she does not believe he’s responsible for the crime. In her second day on the stand, Elizabeth Aguirre told the downtown Los Angeles jury tasked with recommending whether Isauro Aguirre should be put to death or spend the rest of his life behind bars that she was aware that he was convicted of Gabriel Fernandez’s May 2013 killing. But she said his family remains undaunted in their belief that he did not commit the crime. The seven-woman, five-man jury found the 37-year-old former security guard guilty Nov. 15 of first-degree murder and found true the special circumstance allegation of murder involving the infliction of torture, making him eligible for capital punishment. Deputy District Attorney Jonathan Hatami countered that Aguirre was an “evil” man who “liked torturing” the boy and did so systematically in the months leading up to the child’s death because he thought Gabriel was gay. “You don’t believe that he murdered and tortured Gabriel?” the prosecutor asked. ” … We don’t believe it,” Elizabeth Aguirre said when asked if it was true that her entire family felt the same way. She said she would believe that her brother admitted punching the boy 10 times in the face “if he tells me so.” She later told jurors that her sibling has denied torturing and murdering the boy when she has spoken to him. She said he served as an altar boy and attended church regularly as a child, and doesn’t remember her parents ever physically disciplining her brother when he was a child. Aguirre’s sister said that she still believed there was good in her brother, tearing up as she said she would feel “sad” if he was put to death at San Quentin State Prison. Two of his cousins said they, too, had trouble believing the accusations against him. She again said, “from my experience, I don’t see him doing that” when asked whether her opinion would change if she was told that he had admitted punching the boy 10 times in the head. Another of his cousins, Fernando Hernandez, said he was “shocked” when he found out that Aguirre had been charged with the boy’s killing. “The Isauro I know — it’s really hard to believe,” he said, adding later that he did not believe that his cousin tortured the boy over an eight-month period. The defendant’s aunt, Maria Leonor Hernandez, said it would be “very sad” if her nephew was sentenced to death. The testimony came during the third day of the defense’s portion of the penalty phase of Aguirre’s trial. The final witness called by the prosecution last week was the boy’s uncle, Christopher Contreras, who said he still remembers the way his nephew looked in the hospital whenever he thinks about him. Jurors have been shown photos of Gabriel’s battered body lying on an autopsy table with injuries from head to toe and heard testimony from a medical social worker and a Los Angeles County sheriff’s deputy that the injuries– including burns, broken ribs, a fractured skull, missing teeth, multiple BB gun shots — were the worst child abuse they had ever seen. Superior Court Judge George G. Lomeli has told jurors that he expects the case to be submitted to them Monday after attorneys deliver their closing arguments. 30 comments for "Convicted killer’s younger sister says she doesn’t believe he tortured, murdered girlfriend’s 8-year-old son"
They should do the same to him and torture him and then give him death. Of course fanaily members are in denial for his actions!!! They never saw the bad side of him I am sure! He admitted he did it so that is enough besides the evidence in the case . These so called family members are ignorant and selfish and why out of nowhere are they saying something? Because they were called to testify? Why are you so upset with them? If they are asked ‘what did you think of your brother/cousin/whatever why shouldn’t they answer? We all get upset over different things, because we all come from different backgrounds. That’s why I asked. I come from the background of “due process of law is a good thing.” I was wondering what background has Tm so upset about it. You, of course, had to horn in because you come from a background of “attack Tim even if it doesn’t make sense.” I suspect most people recognize that by now. I wasn’t attacking you, Tim. I, also respect due process. This is a public forum, Tim, so I am saying that we all come from different backgrounds as far as life experiences, and we all become upset over different things. You completely misunderstood what I was saying, so I am clarifying. Again, I was not attacking you. I’m sorry that you are upset with my comment. Why would I be upset? It’s just your usual behavior and I’m used to it. Thank you for informing us all that this is a public forum. Thank you for informing us that we all come from different backgrounds. Thank you for clarifying that you just felt it was necessary to once again respond to my comments at every turn and felt that sharing such little known information would be a good way to do so. Your welcome, Tim. I respond to your comments, because this is a public forum, just as you respond to other commenters all day and all night. You have a right to respond and challenge everyone’s comments as you well know. You have a right to attack other commenters on a daily basis, because they don’t view life exactly like you. Other people have a right to challenge your comments. It’s a two way street, is it not? Due process of law is the principle that the government must respect all of the legal rights that are owed to a person according to the law of the land, instead of respecting merely some or most of those legal rights. As I read the comments with the many ‘judgements’ handed out I wonder how many of these judge/jury/executioners of the internet try to dodge jury duty? I wonder how many of them would be willing to do the deed they are so eager to have done in their name. As long as we are eliminating due process of law, how about if we execute bigots like you without trial as well? Sounds like a Parrisite. The same logic that was used to damn Raymond Lee Jennings, Johnathan Ervin, Randy Floyd, and Esmeralda Jorge: I’m Rex and I know best. Screw due process. His aunt said and I quote “it would be very sad if her nephew was put to death.” How does she think Gabriel’s family feels about Isauro murdering him. They keep saying they remember the way he was as a child. They don’t really say how he was now. They know what kind of man he was but they are being selfish and have no emotions about what he did to that poor little boy. Two sides of a killer. This is outrageous! Why does it matter what this monster was like when he was a child? People change, he obviously is a sadistic child murdered that does not deserve for his life to be spared. What he deserves is the same torture he inflicted upon Gabriel. I can’t and will never understand how these monsters could do this to a sweet innocent child. It disgusted me and my heart is broken over a boy I never even met. This is the process. To abandon the process just because a case seems obvious would be a mistake. I think it’s disgusting that his sister is that stupid to believe that monster did not torture Gabriel Fernandez after hearing all the evidence, I mean I get it they don’t want him to be put to death, his sister’s is in denial won’t believe anything even with all the evidence and testimony is just ridiculous to me. The monster’s family is stupid to be blind to what the monsters done to poor innocent Gabriel Fernandez and knowing and probably hearing the testimony of his siblings about the heinous crime of torture he inflicted on poor Gabriel they’re stupid to believe that the monster only have struck Gabriel 10 times. I’m disgusted with these character witnesses. Calling a biased witness to tell the jury that heard all the testimony “you got it wrong” doesn’t seem like the most sound strategy. I’ve lost faith in humanity. How are they even deciding whether they should face death penalty. As for his family shame on you!!!! No matter what he is a MURDERER! He deserves to face death penalty! He shouldn’t even have a place to sleep or eat in jail! Isauro, Pearl and the social workers involved deserve harsh punishments! 100% agree,social worker should take same charges as pearl and isidro bottom line.thank to these irresponsible people Gabriel died. It was alot more “sad” that Gabriel was sentenced to death, by this demon! Gabriel didn’t have a choice! He was maliciously murdered! Apparently there’s a lack of brain cells throughout the entire gene pool. Surprisingly, not one of them convinced me that his life should be spared.